Lot 51: AN EGYPTIAN ALABASTER FIGURAL JUG. "This Lot is Withdrawn." 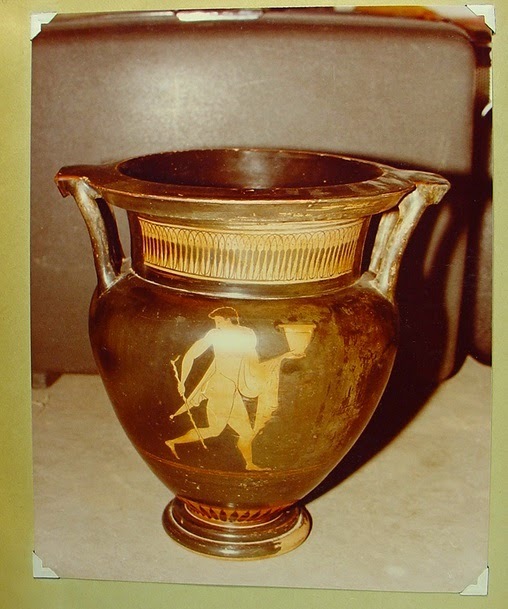 Lot 95: Athenian red-figured krater. "This Lot is Withdrawn." Lot 133: A FALISCAN BLACK-GLAZED ASKOS. "This lot has been withdrawn from the sale." Collecting history: "with Phoenix Ancient Art, Geneva, 1997"; "PROPERTY FROM THE MICHAEL AND JUDY STEINHARDT COLLECTION". Lot 139: A ROMAN MARBLE COLUMN CAPITAL. "This Lot is Withdrawn." Dr Christos Tsirogannis had linked lot 95 to photographs associated with David Swingler, and lots 51 and 139 to the Schinoussa archive. It is not clear why the askos was withdrawn from the sale, although it joins the Sardinian figure also from the Steinhardt collection. Who owned the askos prior to 1997? What does it say about other objects that were derived from this route? What about the mummy mask that was acquired by the St Louis Art Museum (SLAM) in 1998? Do the staff at Christie's need to review their due diligence process to make it more rigorous? And why have the lots been withdrawn when in the past the sales have proceeded? Can we detect a change in policy at the auction-house?